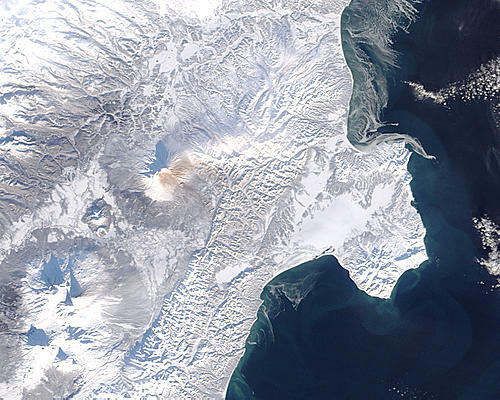 MODIS will sometimes be required depending on the availability of LANDSAT images or requirements of a project that require spectroradiometer data. Ash plumes on Kamchatka Peninsula, eastern Russia. Hurricane Katrina near Florida peninsula. Solar irradiance spectrum and MODIS bands. Detailed, photo-like view of Earth is based largely on observations from MODIS. The Moderate-resolution Imaging Spectroradiometer (MODIS) is a payload scientific instrument launched into Earth orbit by NASA in 1999 on board the Terra (EOS AM) Satellite, and in 2002 on board the Aqua (EOS PM) satellite. The instruments capture data in 36 spectral bands ranging in wavelength from 0.4 µm to 14.4 µm and at varying spatial resolutions (2 bands at 250 m, 5 bands at 500 m and 29 bands at 1 km). Together the instruments image the entire Earth every 1 to 2 days. They are designed to provide measurements in large-scale global dynamics including changes in Earth's cloud cover, radiation budget and processes occurring in the oceans, on land, and in the lower atmosphere. Three on-board calibrators (a solar diffuser combined with a solar diffuser stability monitor, a spectral radiometric calibration assembly, and a black body) provide in-flight calibration. MODIS has used the Marine Optical Buoy for vicarious calibration. The MODIS Characterization Support Team (MCST) is dedicated to the production of high quality MODIS calibrated product which is a precursor to every geophysical science product. A detailed description of the MCST mission statement and other details can be found at MCST Web. One major use of MODIS data is for detection and mapping of wildland fires in the United States. The United States Forest Service's Remote Sensing Applications Center analyzes MODIS imagery on a continuous basis to provide information for the management and suppression of wildfires. The following MODIS Level 3 (L3) datasets are available from NASA, as processed by the Collection 5 software. Raw MODIS data stream could be received in real-time using a tracking antenna, thanks to the instrument's direct broadcast capability. ftp://n4ftl01u.ecs.nasa.gov/ — snow and ice datasets. Most of the data is available in the HDF-EOS format — a variant of Hierarchical Data Format prescribed for the data derived from Earth Observing System missions.